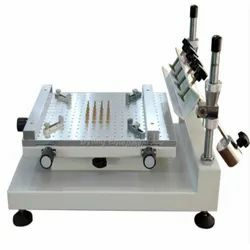 Our range of products include solder paste printer, manual solder paste printer, smt automatic pick and place machine (2 heads without vision), smt automatic vision pick and place machine (2 head with vision), smt automatic vision pick and place machine (4 heads) and 6 nozzle online pick & place machine. 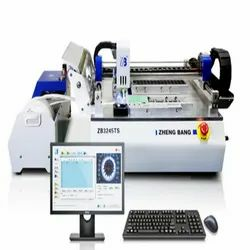 ZB3040H high precision stencil printer is mainly designed for the requirement of the single or double-side PCB soldering paste and red glue printing, the working platform is processed by cellular positional hole with high quality aluminum and the pedestal is soldered by thick steel plate, steadiness and durability. 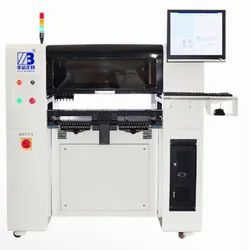 ZB3040H high precision stencil printer is mainly designed for the requirement of the single or double-side PCB soldering paste and red glue printing, the working platfore is processed by cellular positional hole with high-quality aluminum and the pedestal is soldered by thick steel plate, steadiness and durability. ZB series placement machine main features are small volume, easy operate, run stable and affordable price. They can mount 0402, 0603, 0805, 1206, 1210, 3528, 5050, SOP and QFN etc. 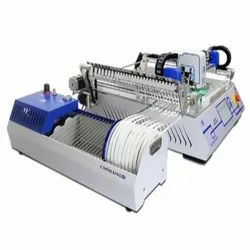 These machines can help to avoid the unstable performance because of mannual mounting and reduce the rent cost, improve the product capacity at the same time. 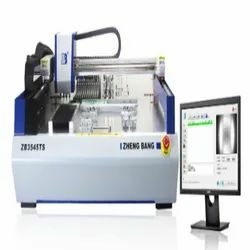 The ZB series mounter is suitable for small and medium sized enterprise mass production, experimental development, sample trial production and school teaching and so on. The design concept of the machine is to meet the need of the vast number of small and medium customers, with the rapid and accurate mounting, easy operation, stable running and affordable price. 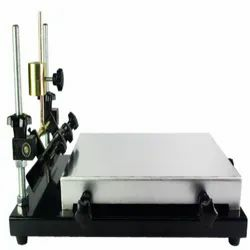 Pick and Place machine is small in volume ,easy operable,stable and very affordable. Principle axis collocate Taiwan silvering straight slight rail that improves the precision. High resolution CCD Industrial camera which corrects the offset of pick up material. Configuration with servo system to meet high precision positioning. 4 Head design which mounts micro and integrated IC component quickly. The humanization control panel which takes care of every steps of your operation. Pick and place machine is a robotic assembly device that uses a vacuum to lift a component off of a piece of tape, rotate it to the right orientation, then place it on a circuit board. Six juki nozzles produce higher speed in pick and place. SMEMA standard is adopted for online pick and place machine. Humanized software is friendly to operators. TBI ball screw provides stable performance. ZB series reflow furnace is mainly for the production and maintenance of SMT products such as desktop solder reflow equipment. 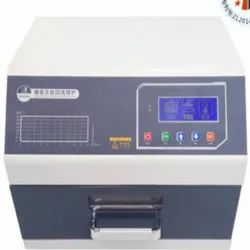 Through the microcomputer's precise control, the temperature of the reflow oven curve control canbe more accurate, and the temperature of the reflow plane can be more uniform. 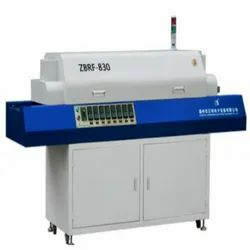 ZB series reflow furnace is fully able to adapt to a variety of different alloys and lead-free solder reflow requirements. ZBRF-830 adopts the M-type stainless steel finned heating pipe with corrosion resistance, high temperature resistance, long service life and high heat efficiency. Cooperating with hot air circulation system, the heat storage structure allows the heat to be fully used. The multi-layered heat insulation structure minimizes the loss of heat. The temperature is controlled by PID closed circle, with highly precise temperature control. Looking for SMT Machine ?